The Senate Judiciary Committee conducted the confirmation hearing for Todd M. Hughes this past Wednesday. You can view the committee hearing at this page: [Link]. Only one senator appeared to be in attendance during the questioning of Mr. Hughes. At one point, Mr. Hughes was asked which jurists he felt set the standard for judicial temperament. As one example, Mr. Hughes cited Senior Judge Bryson as exemplifying an extremely fair and well-prepared judge. Mr. Hughes commented that he has no familiarity with intellectual property matters, which make up roughly thirty percent of the Federal Circuit’s docket. He noted that he does have experience in the remaining portion of the Federal Circuit’s subject matter. 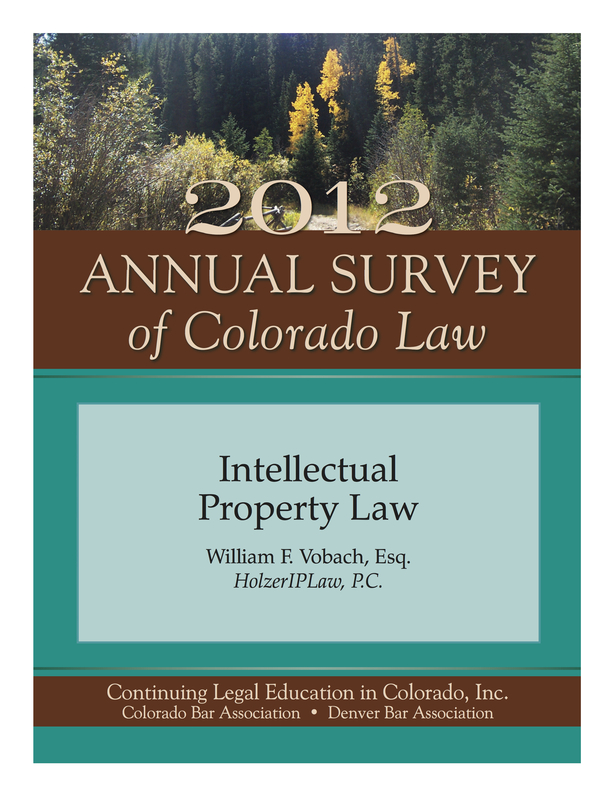 Over the past couple of years, I’ve been writing the intellectual property chapter for the Colorado Bar Association’s book Annual Survey of Colorado Law. While the book focuses on Colorado law, the intellectual property chapter tends to be dominated by federal developments. This year’s publication is now available for download (for a nominal fee) in its entirety or by individual chapter from the CBA-CLE website: [Link]. Mark your calendars. The 2013 AIPLA Electronic and Computer Patent Law Summit will be taking place this year on August 27, 2013 in San Jose, CA. I hope you can join us. The Summit will include another blockbuster lineup of speakers, as in years past. Michelle Lee will be providing an update on the Silicon Valley branch of the USPTO. Professor Mark Lemley will be addressing the increasingly hot issue of functional claiming. Aaron Brodsky, Wayne Sobon, Sandy Godsey, and Steve Shumaker will be conducting a panel discussion on issues related to the AIA. Ray Hom and Trip McIntosh will be discussing foreign filing licenses and export control. Reggie Davis will address the protection of software. Michael Dunnam will be leading Allen Lo, Krishna Pathiyal, Andre Marais, and Brian Batzli in a panel discussion of how to build and enforce an international portfolio. The Honorable Ronald Whyte will be speaking on “Patents and Innovation.” And, Ernie Beffel will be hosting a panel discussion of the value of patents to entrepreneurs and venture capitalists with Erik Oliver, Matt Ocko, Richard Ogawa, and Jan Blaustein Scholes. The Summit will be taking place at the San Jose Hilton. The cost of the Summit (without hotel) is $195 for AIPLA members and $345 for non-members. This is really a great deal when you consider, for example, that a one day ticket to the Federal Circuit Bench and Bar conference is $875. You can download the brochure for the Summit here: [Brochure]. The planning committee for the Summit this year was Michael Drapkin, James Hallenbeck, Michael Dunnam, Ernie Beffel, Tim Christman, Robert O’Connell, John Salazar, and myself. See you on August 27th! An appellant was arguing to the court recently that boilerplate preceding the claims section of a patent should preserve a broad claim interpretation even though the specification taught a single embodiment and made a rather strong statement about that embodiment. That prompted Judge Lourie to comment that such boilerplate does not expand the disclosure: [Listen]. Other judges have given boilerplate more importance. See, e.g., [Abraham Lincoln’s Boilerplate]. For other posts on boilerplate, see [Associate Solicitor Encourages Federal Circuit to Apply Boilerplate from Specification] and [Summary of the Invention]. You can listen to the entire oral argument that is referenced above [here]. It would be interesting to see a plot of the rise and fall of use of the term “the present invention” in patent applications. With cases like Scimed v. Advanced Cardiovascular Systems, 242 F.3d 1337 (Fed. Cir. 2001) and Honeywell v. I.T.T., 452 F.3d 1312 (Fed. Cir. 2006), I suspect there has been a precipitous drop in use of “the present invention” as a stand-alone phrase. The oral arguments in recent appeals in the pharmaceutical arena highlighted the issue once again. In the appeal of Albany Molecular Research, Inc. v. Dr. Reddy’s Labs, Ltd., No. 2011-1232 (a case that settled after oral argument), Judge Bryson raised the issue of “the present invention” language with the patent owner’s counsel: [Listen]. Later in the oral argument, the attorney for the opposing side asserted that the stand-alone phrase had limiting effect, as well: [Listen]. Subsequent to that first oral argument, a second oral argument was held in the case of Aventis Pharmaceuticals, Inc. et al. v. TEVA Pharmaceuticals USA, Inc. et. 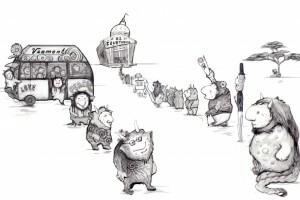 al, 2011-1335, -1336 (Fed. Cir. 2013). The two cases concerned different patents that share a common specification. During the second oral argument, a discussion of “the present invention” language once again took place. Judge Bryson asked the attorney for the patent owner whether the language “the present invention” was limiting: [Listen]. Later in the oral argument, the attorney for the opposing side advocated for a limiting claim construction based on the use of “the present invention” in the Abstract, Summary, and Detailed Description sections of the patent: [Listen]. While Judge Bryson seemed curious during both oral arguments about the impact of “the present invention” language, his dissent in the Aventis case (as well as the majority’s opinion) ultimately makes no mention of “the present invention” language. You can listen to the entire oral argument of 2011-1232 here: [here]. You can listen to the entire oral argument of the Aventis case here: [here]. You can read the Aventis opinion here: [Link]. You are currently browsing the 717 Madison Place blog archives for June, 2013.